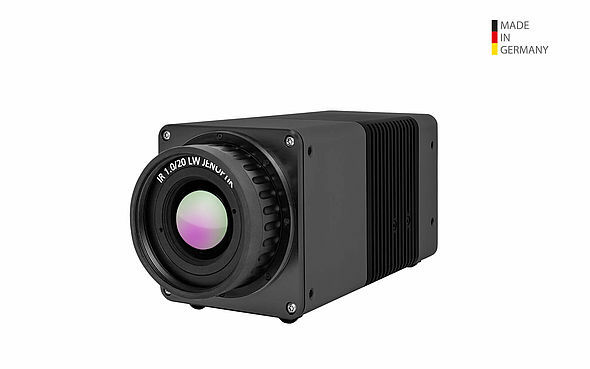 The InfraTec VarioCAM® HD head security is a thermal infrared camera system for securit and suveillance applications, based on an uncooled microbolometer FPA detector with (640 x 480) or (1,024 x 768) IR pixels, and is ideal for demanding monitoring and measurement tasks in stationary or vehicle-mounted operation. Images with resolutions of up to 3.1 Megapixels can be taken in combination with the integrated MicroScan feature, which was designed for continuous operation. The VarioCAM® HD head security generates brilliant 16-bit thermographic images of highest quality and offers unprecedented measurement ranges and efficiency, especially during day and night detection and identification of distant persons and vehicles. The various sets of equipment make it easy to adjust the setup to the respective measurement task: The application range includes automatic threshold recognition and signalling up to digital realtime image acquisition via Gigabit-Ethernet. The all-weather light metal housing (IP67) allows trouble-free and inexpensive operation under harsh weather conditions. The big standard temperature range, a complete optical assortment as well as the extensive equipment and the powerful IRBIS® 3 software for thermographic data acquisition and evaluation make the VarioCAM® HD head security an ideal tool for monitoring and investigation. With the application-specific configuration, this stationary thermographic system is even suited for tasks, which require continuous and automatic operation.